Malcolm Brogdon of the Milwaukee Bucks became the first player of the 2016 draft class to record a triple double. In just his second NBA start, the Virginia alum put up an impressive 15 points, 12 assists and 11 rebounds in the 116-96 win in Chicago. The 24 year old Point Guard has impressed as the back up point guard so far this season, and stepped up in a big way in place of Matthew Dellavedova. Giannis Antetokounmpo continued his astonishing season by filling the box score with 35 points, 9 rebounds, 7 assists and 7 blocks, which is a career high. Jabari Parker also had a strong performance, scoring 27 points and grabbing 5 rebounds. Jimmy Butler led the Chicago renaissance with 28 points, 8 assists and 7 rebounds; But it was by no means enough as Milwaukee cruised to victory at the United Center. The Milwaukee Bucks made the Eastern Conference Playoffs back in 2015, but fell short of the 8th seed last season, and are looking to work their way back into the mix. With an even 16-16 record and the 7th seed locked up heading into the new year, Bucks fans must be feeling positive about the teams chances of returning to the post-season. The Bucks certainly seem to be living up to their motto, ‘Own The Future’, and they once again seem to have struck draft gold in Malcolm Brogdon, who was not by any means expected to bump his way up into the Rookie Of The Year conversation. The Bucks took a chance in the 2013 NBA draft by drafting Giannis Antetokounmpo with the 15th overall pick, and it has undoubtedly paid off for them. 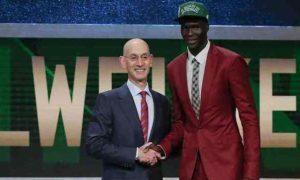 They took a similar approach in 2016, drafting another young athletic big, Thon Maker in the first round. Drafted with the 36th overall pick, and one of the oldest players in the draft, Brogdon has brought a high level of basketball IQ to the upcoming Bucks team. He already seems to be developing into the annual ‘second round star’, which happens every season in the NBA. Just two days ago I predicted in my previous article that Malcolm Brogdon would be the Second Round sensation of 2016, and he may well be developing into that role a lot sooner than I expected. So another impressive young talent has joined the ranks of this exciting young Bucks team. If i were you, I’d hop on this Milwaukee train now, as this team will most certainly be competing for the Eastern Conference title in the not too distant future.